In my capacity as a Leadership Coach at Stanford's Graduate School of Business, I work regularly with groups of MBA students whose purpose is to help the members learn, become more self-aware (and more aware of others), and change their behavior in order to achieve their goals more effectively. But I'd argue that every group in every organization serves one or more of these purposes in addition to the group's explicitly stated function. Intentionally or not, each group in which we participate serves as a de facto learning laboratory, within which we come to understand how our interactions with others support or undermine our efforts to accomplish the tasks noted above. It's clear that some groups are more effective than others at helping the members learn, increase their awareness and change their behavior, and I believe that the group's levels of safety, trust and intimacy are the key factors in determining its effectiveness in this regard. 1) Every group's experience is rooted in a set of initial conditions: How and why were we assembled? What will our first meeting be like? What will we discuss there? These initial conditions form the foundation for all subsequent "layers" of the group dynamic. 2) The foundational qualities that define every group are the levels of safety, trust and intimacy: Safety = A belief that we won't get hurt. Trust = We mean what we say and we say what we mean. Intimacy = A willingness to make the private public. 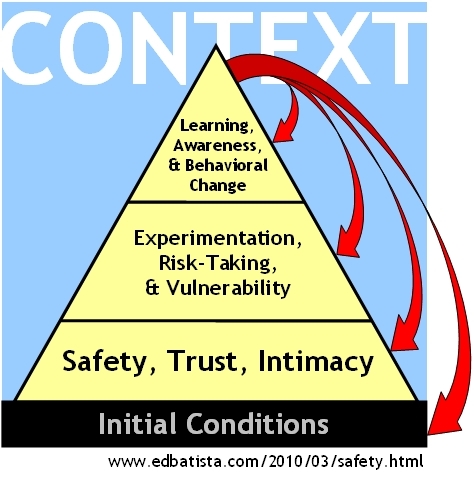 3) When safety, trust and intimacy are established, these qualities support the actions that lead to greater success as a group: experimentation, risk-taking and a willingness to be vulnerable. 4) When we feel able to experiment, take risks and make ourselves vulnerable, our ability to learn, to increase our self-awareness (and our awareness of others) and to change our behavior in order to achieve our goals more effectively increases dramatically. 5) The process of building one layer upon another occurs in a unique context—so in addition to asking whether learning and change are taking place, we also need to assess how the group's context supports (or inhibits) the development of the underlying layers in the group dynamic. Learning, awareness and change become self-reinforcing norms in the group. Group members become more willing to experiment, take risks, and express more vulnerability. We value the importance of safety, trust and intimacy and act to enhance these qualities in the group. And we identify and seek to replicate initial conditions that support the development of these qualities in future groups. How will the group's initial conditions support or inhibit the establishment of safety, trust and intimacy? At each step of the group's subsequent development, are we increasing or decreasing the levels of these qualities? What behaviors in the the group dynamic support the development of these qualities? And what behaviors inhibit these qualities? A final point regarding feedback: While excessive delicacy and indirectness inhibit learning, awareness and change, the degree of candor and directness in a group must be calibrated to the group’s current levels of safety, trust and intimacy. Feedback attuned to these qualities can increase their presence in the group by stretching the group’s capacity for candid and direct discussion. But feedback that fails to take these qualities into account can actually lead to less safety, trust and intimacy than before and undermine the group’s ability to learn and change.